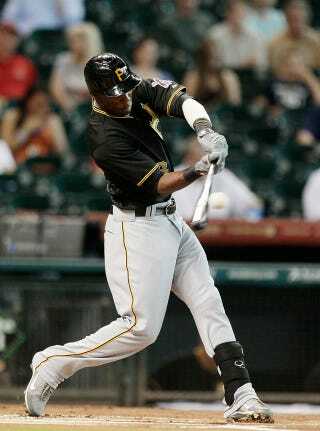 On the first swing of his major league career, Pittsburgh's Starling Marte homered tonight to deep left-center field in Houston. He became the first Pirate in 51 years to homer in his first at-bat, as well as the 28th player in MLB history to homer on his first pitch. That ranks just behind perfect games (22), four-HR games (16), and unassisted triple plays (15) in terms of historical rarity. Marte has tremendous tools and has moved aggressively through Pittsburgh's system despite a real lack of polish at the plate that makes him a very high-beta prospect. ... The Pirates might have a successor to Andrew McCutchen, or just a maddening bench guy who looks like he should be a star. Of course, we're talking about the smallest of small sample sizes here, but Marte, who hit leadoff and went 2-for-4 in a Pirates win tonight, is off to a very good start.